I really do love a literary festival. I can’t say I have been to hundreds, in fact it’s more like five or six, but when I saw loads of people I know going off to Edinburgh over the last few weeks I have been, frankly, green with envy. There is something so special about the vibe of these events, the coming together of reader and author and the general love of books that makes me go giddy at the thought. Last year I had the pleasure of going to Manchester Literature Festival, which is the nearest to me (Liverpool doesn’t have one, why? ), and seeing many of the events and meeting the authors and event hosts afterwards for The Readers Podcast. This year, in October, I am planning to do the same again, and a little more as you will see, and what an incredible line up there is this year. I already have sorted tickets for the opening event next week, a trailblazer, which is with none other than Zadie Smith who I am really keep to see talk, especially after having dipped into ‘NW’ already, which I am planning on reading properly this weekend between Green Carnation submissions. This is an event to kick start it all officially and I will be reporting back on for you all. After the festival starts ‘a proper’ in October I have a mammoth wish list of events to see with authors including; Michael Chabon, Carol Ann Duffy, Penelope Lively, Salley Vickers, Clare Balding, Pat Barker, Jackie Kay, Mark Haddon, Jeanette Winterson, AM Holmes, Jonathan Harvey and ‘Unbound Live’. Phew! You can see these events and many more on the festivals calendar page. I think I am going to miss some sadly as I will be in Iceland, maybe someone reading this might report back for me? To top it all off though there are two other events on the calendar that I am particularly excited about and that is because… I am hosting them! 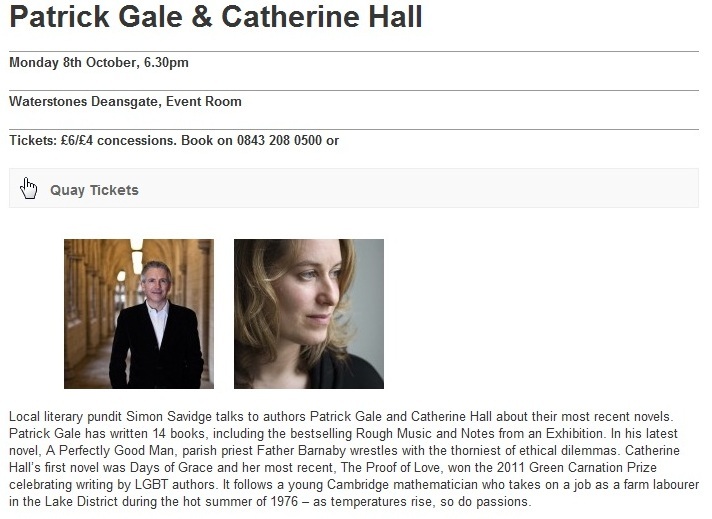 The first will be on Monday the 8th of October at 18.30 when I will be hosting an event with Patrick Gale and Catherine Hall, who happens to be a fellow Green Carnation judge and also wrote ‘The Proof of Love’ which won the prize last year and was a book I adored. I am going to be re-reading a few Patrick Gale novels over the next couple of weeks including his latest ‘A Perfect Man’ and ‘Rough Music’ which I read, shock and horror, over a decade ago. The second event I am just as excited about and is at lunchtime on the following day. 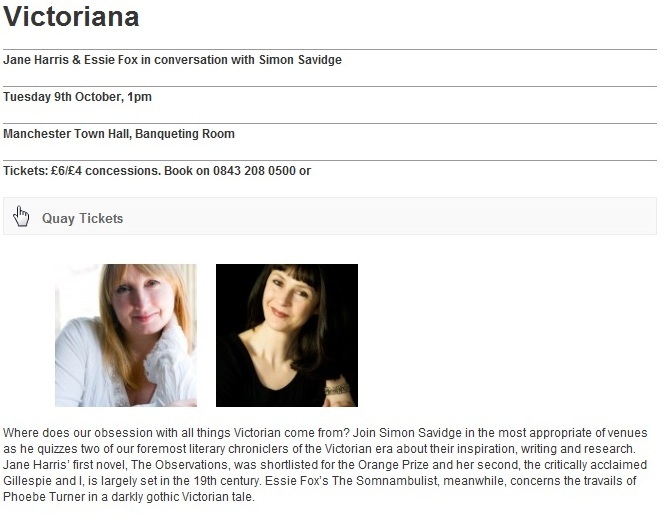 In the oh so apt Manchester Town Hall, which was used in Sherlock Holmes as the House of Parliament, I will be hosting a Victoriana event with the lovely Jane Harris and Essie Fox, both of whose work I have thoroughly enjoyed as I am sure you are aware. I have had the pleasure of interviewing Jane and Essie before so I know this is going to be a hoot. The Vancouver International Writers and Readers Festival is an event I look forward to every October, even though it means travelling 1 1/2 hours by plane to get there from where I live. The “Readers” in the title might be the key to why it is such a great festival; they really do focus on the audience for books. This year, A.L. Kennedy is the author I’m most looking forward to hearing, along with two sessions where I’m just as keen to hear the host as the interviewee: Cory Doctorow with William Gibson, and Chip Kidd with Douglas Coupland. I would like to see A.L. Kennedy talk actually. I like her dry sense of humour. I notice that flyer in your picture describes you as “local literary pundit”. There’s proof, if you needed it, that you are “literary” after all. Hahahahaha true. I should have a tattoo of that on my forehead. I am fortunate in having the Hay on Wye and the Cheltenham Literature Festivals relatively close by and can highly recommend them both. I saw Penelope Lively at Cheltenham last year and can assure you that you will not be disappointed. She is a brilliant speaker. I have just finished Patrick Gale’s latest book, A Perfectly Good Man and am hoping to see him (and Gaynor Arnold) at the Birmingham Book Festival in October. However, my favourite festival author to date is the Israeli author, David Grossman (To the End of the Land) – thought provoking, articulate and wise – I was completely mesmerised. The best thing about book festivals? Being surrounded by like-minded people who don’t mind when you accost them in the festival book shop to recommend/rave/chat about the book they are holding…! Patrick Gale was utterly lovely, really friendly and very funny, and he told me some hilarious stories about the industry and a certain Richard and Judy, but I am sworn to secrecy. I didn’t even know Sheffield had one, whoops. Oooh, I am quite excited about this – that Victoriana event had already caught my eye and I didn’t realise you were hosting. I am also really keen to go to ‘From St Petersburg To Manchester’ with Edward Docx, and the ‘Bio Punk’ event. It is looking like night shifts might scupper at least some of my plans but I’ll be happy even to make it to one or two events. It will be my first attendance at any sort of literary festival so not entirely sure what to expect! Did you come to the Victoriana event? If so you should have said hello it was a lovely event.